302 pages | 2 B/W Illus. How is the process of globalization effecting changes in the structure of knowledge in sociology? This path-breaking volume looks at the human dimension of developments in the discipline by compiling a set of interviews that exemplify the life and work of a sociologist today. Their ideas and conceptualizations show to what extent a "paradigm shift" has taken root, answering questions such as whether sociology still remains a differentiated, relatively autonomous social science. The chosen interviewees are about equally divided according to gender and have been selected from among professional sociologists in different parts of the globe, with an emphasis on areas that are under-represented in English publications, such as East Asia, Latin America, and Africa. Analysis focuses on changes which are becoming clear from the on-going confrontation between "traditional" sociology which emerged as a project of modernity, and the sociology practiced by sociologists who are called upon to adapt the discipline to the upheavals of the twenty-first century. CHAPTER 3. HOW DOES SOCIAL TRANSFORMATION HAPPEN? 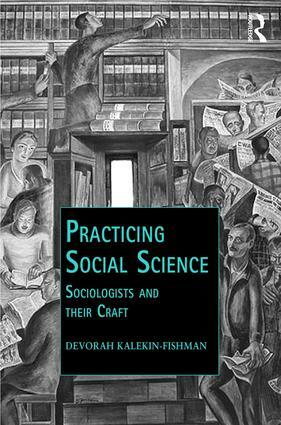 Devorah Kalekin-Fishman is Emerita and Senior Researcher in the Faculty of Education at the University of Haifa in Israel. Recent publications include: From the Margins to the Center: An Autoethnography of Passage between Disciplines (with Lea Hagoel, 2016) and The Shape of a Sociology for the 21st Century (ed. with Ann Denis, 2012). She was Vice-President for Publications (2006-2010) for the International Sociological Association. The sociology of knowledge has a long and distinctive history. Its function has always been that of attempting to bridge the aspirations of the discursive and institutional founding fathers of sociology with that of modern attempts to define the discipline through the study of the emergence, role and social function of ideas. However, since Mannheim first outlined his program in the 1920s, the sociology of knowledge has undergone many changes. The field has become extremely differentiated and some of its best practitioners now sail under different flags and discuss their work under different headings. This new series charts the progress that has been made in recent times - despite the different labels. Be it intellectual history Cambridge-style, the new sociology of ideas which is now gaining strength in North America, or the more European cultural analysis which is associated with the name of Bourdieu, this series aims at being inclusive while simultaneously striving for sociological insight and excellence. All too often modern attempts in the sociology of knowledge, broadly conceived, have only looked at form while they downplayed or disregarded content, substance of argument or meaning. This series will help to rectify this.